Being able to precisely apply appropriate nutrients or understand exactly the amount of grass in a field or across a farm provides huge scope to save money and better manage resources. Treating grass like a crop and embracing variable rate fertiliser application systems commonly seen as arable technology could bring big benefits to dairy producers. 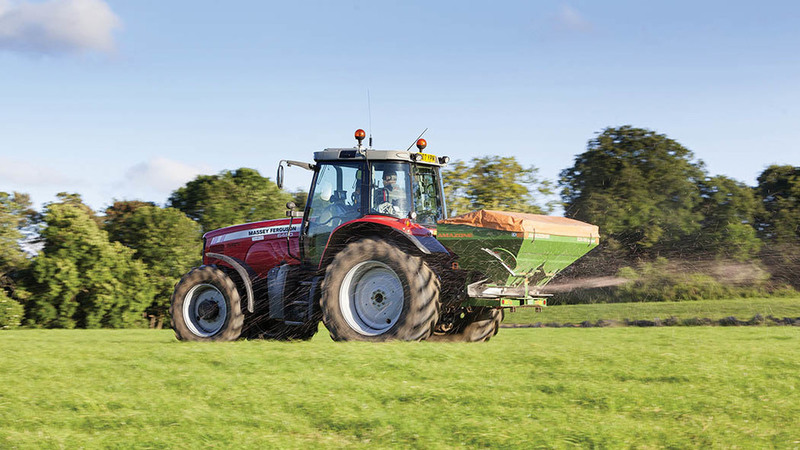 Precision fertiliser systems are becoming increasingly available on smaller machinery models, making them more applicable to grassland systems. At the same time, industry projects are paving the way for the development of more grass focused technologies. Various companies offer soil mapping services using GPS technology and soil sampling to map soil nutrient variation across a farm. Soil mapping can then be used with fertiliser spreaders which incorporate GPS to target specific fertilisers where necessary, thus saving money by not applying unnecessary nutrients. These systems show the operator where to drive for optimum efficiency and help avoid over-spreading. GPS can be particularly helpful on grassland systems which do not have tramlines to work to. AN Innovate UK project has been looking at the use of a tractor-mounted N sensor which can determine nutrient requirements as the tractor drives across a field, allowing fertiliser to be applied at the appropriate rate there and then. The project has been looking at how to develop the tractor mounted Yara N sensor, traditionally used on arable systems, for grassland setups. The tractor-mounted system measures light reflectance properties of crop canopies to determine crop N status as the fertiliser spreader moves across the field. The fertiliser rate can then be adjusted accordingly. The N sensor has now been tested across different grass species, management and farm systems. Pete Berry from ADAS has reviewed new tools for optimising grass production and believes the sensor has big potential. He says: “Results were promising and indicate the sensor can sense differences in grass biomass and N content in different parts of a field across several grass species. The use of satellites to precisely measure grass covers on-farm is likely to be possible within the next two years, thanks to an Innovate UK-funded project. As part of the ‘Innovate Grasslands’ project, satellite data on grass covers were collected from commercial farms between November 2016 and March 2017. This was compared to grass plate meter data and historic data. Satellites looked at normalised differential vegetation index using grass colour spectrum. This was combined with weather information in a grass model to predict future grass growth. Fixed wing drones with multi-spectrum cameras were also used. Following this work, commercial partners are now involved, meaning a product is likely to be available in the next couple of years. Routinely measuring grass availability is a must for efficient utilisation and to allow forward planning, but the regularity needed is often a chore, making any technology which can simplify the process highly attractive. There are now various bits of kit available to farmers which can be used to precisely measure grass covers, either by foot, by air or from the comfort of a quad bike. Most come backed up with recording and monitoring software and apps to enable even closer grassland management. Some can be shipped in from other countries, such as New Zealand and Ireland, with UK partners often distributing directly in the UK.